This picture was taken at 3PM on Monday September 30th, 2013. Perhaps our elected officials can get off their asses and act as volunteers for WWII Veterans visiting the Memorial. More than 950 Veterans are scheduled to see the Memorial this week with Honor Flight. “We fly in tomorrow but because of the furlough we have been told the World War II Memorial will be barricaded. We cannot stop our flight plans and we are the only Honor Flight coming into DC tomorrow. This is so unfair for all the hard work and money we have raised for this project. Wednesday there are five Honor Flights coming into DC also. The studio joke is that the only way you can see Washington “not under construction” is to buy the DC PHOTO BOOK. Now the only way you can see DC is online! I’ll be there in the morning to see if Congress has the nerve to turn our WWII Veterans away from a Memorial which they waited so long to see. 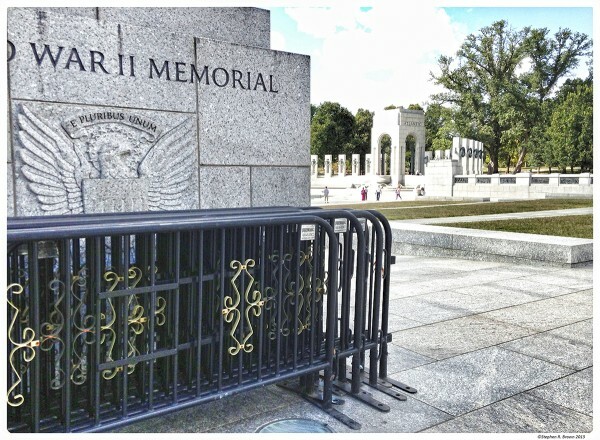 September 30, 2013 | Filed under Blogs, DC Photo Book, Photography, WWII Memorial and tagged with Arlington Cemetery, DC PHOTO BOOK, Jewel of the Mall, Kaskey, Memorial Day, National Park, patriotism, photography, Senator Robert Dole, Travel, veteran, Washington, world war ii, World War II Memorial, WWII Memorial.